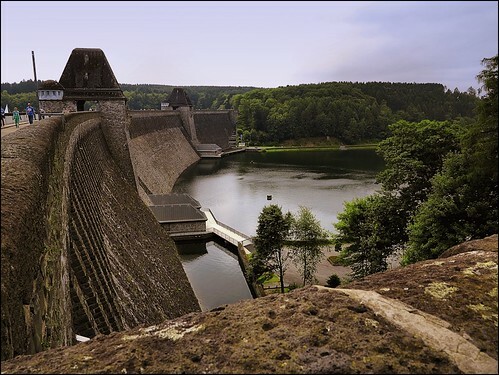 My interest for the Møhne dam in the photo was raised as we last summer was taking an overnight stop in the North-Rhine Westfalia region to go for a 50km bike tour around the Møhnesee (lake). Absolute interesting bike tour and coming to the one end of the lake we suddenly could see this old dam in the lake Møhne (the dam constructed around 1910). Thinking back to the time of WWII it seemed almost strange that this dam should have survived the war. Which was not what the English wanted. In fact they bounce bombed the dam with great success in 1943 - it was partially destroyed and it took a lot of resources to bring it back in working order for the Germans. "Ruhr production would have suffered the heaviest possible blow."